The New York branch of architecture firm OMA will create an extension to the city's New Museum next to its SANAA-designed home. The expansion will double the size of the contemporary art museum, which opened in its current location in Bowery 20 years ago. Taking the place of an adjacent property bought by the museum in 2008, the new building will stand distinctly beside the already iconic structure by Tokyo-based architects Kazuyo Sejima and Ryue Nishizawa of SANAA. "The new structure will complement and respect the integrity of the museum's flagship SANAA building as a singular, critically acclaimed work of architecture," said a statement from OMA New York. The expansion was first announced in May 2016 and is set to provide an extra 50,000 square feet (4,645 square metres) of gallery space, improved circulation, and multipurpose areas for the New Museum's programming. It will replace 231 Bowery, which currently hosts the museum's New Inc start-up lab and storage for artworks. "Having collaborated with Kazuyo Sejima and Ryue Nishizawa on a number of projects in Europe, it is a real honour to stand alongside their great work of architecture, one of my favourites in the city," said OMA founder Rem Koolhaas. This will be OMA's first public building in New York, where the firm set up an office in 2001 to up its presence in the Americas. Led by architect Shohei Shigematsu, the studio is currently working on an apartment building for Manhattan, and has recently completed several installations in the city. Completed in 2007, SANAA's New Museum comprises seven storeys of galleries and event spaces, contained within a series of irregularly stacked volumes wrapped in metal mesh. The project is credited with helping to spark the revitalisation of Bowery, which was a notoriously seedy neighbourhood but is now home to several boutique hotels, fashion stores and restaurants. "As a Japanese architect, I am very happy to engage in a unique dialogue with SANAA and build alongside one of their seminal works," Shigematsu said. 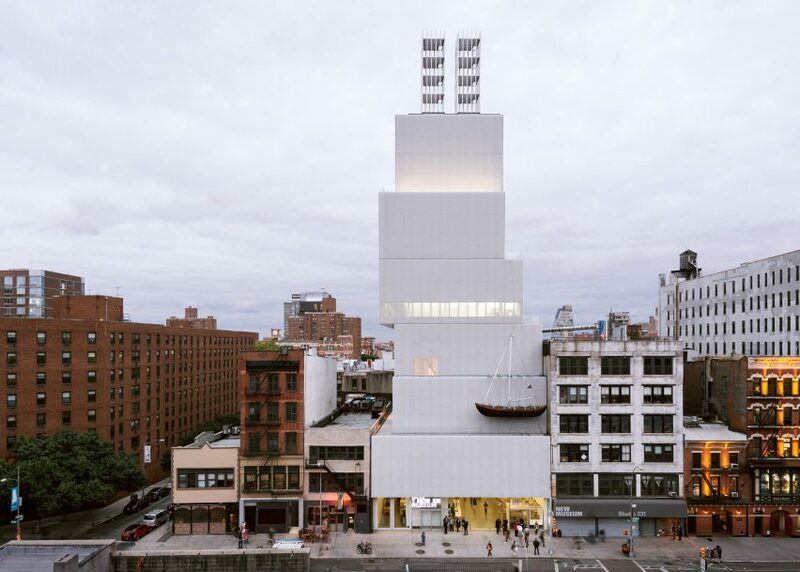 The New Museum is New York City's only museum dedicated exclusively to contemporary art. It was set up in 1977 and has since provided living artists a space to experiment with ideas. "Together, Shigematsu and Koolhaas have demonstrated a keen understanding of the institution, an exceptional ability to meet our specific program requirements, and a deep sensitivity to the existing museum building," said Massimiliano Gioni, associate director and director of exhibitions. Images of OMA's design are yet to be released, but the expansion is due to break ground in 2019. Photograph is by Dean Kaufman.